More than a 100 people was gathered a November evening, at a rooftop terrace, in the old city of Marrakech to eat, mingle and learn about New Nordic Food and urban farming. The event was hosted by the Nordic Council of Ministers in collaboration with us. The guests; employees from the Nordic embassies in Rabat, climate researchers, Ambassadors, diplomats, local business acquaintances and other employees and friends of the Council was all in Marrakech as participants at COP22, the International Climate Conference. They were served a four-dish dinner, composed of organic vegetables, fruits, cheese and nuts, all freshly picked in the Marrakech area, prepared on an improvised kitchen consisting of a table and a barbecue. To accompany the food the guest had three types of organic Moroccan wine. We were invited to choreograph and implement the event in accordance with the principles of New Nordic Food, a focus area of the Nordic Council of Ministers. But how to do New Nordic Food in Morocco? Taking offset in the values: Season, ethics, health, and sustainability we chose to do an all vegetarian menu, based on what was growing and ripe in the area, at the moment. We also did an effort to find and support small local, environmental and social sustainable producers of everything from what was on the plates to what the dinners was served on. Marrakech is historically known for it`s beautiful ornamental gardens, and the flat roofs and courtyards of the Riads could potentially be used for growing food all year around. Nevertheless are growing crops not very visible inside the city. This might change in the near future. A government-sponsored project in Casablanca has for the last ten years researched on urban agriculture as an integrative factor of climate-optimised urban development, and in April 2017 Marrakech is hosting an international conference on urban agriculture and food security. Organic farming is not a new phenomenon in Morocco. Traditionally food has been produced small scale, using natural methods and following the lunar calendar. This tradition, called Beldi is to some extent still followed today, especially during religious festivals. However, certificated organic production is still relatively small, but growing. In the Menara district in Marrakech it is possible to by organic fruit, vegetables, bread and animal products directly from the farmers at the Marchè Paysan, every Saturday morning. Half an hour drive out of Marrakech, at the foot of the impressive Atlas Mountains, lies the Ourika Valley. In this fertile area we found most of our local partners, and harvested the commodities for our food event. Omar Hajji inherited few years ago his family’s olive farm and started together with his wife Kenza the process of transforming the then arid landscape into a lush and abundant organic farm and research centre. In addition to being a place for sharing practical knowledge the farm is also arranging seminars and workshops on subjects related to environmental health, human health and intercultural understanding. At Marrakech Organics they are now producing olive oil and black olives as well as fresh, organic fruits and vegetables, animal products, aromatic and medicinal plants grown following permaculture principles and tools. The production is now huge enough to provide up to hundred families with a basket of freshly grown every week. 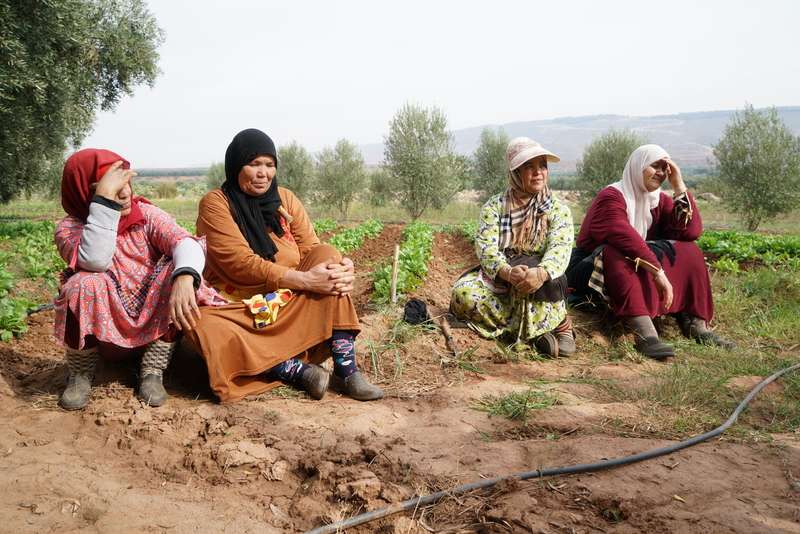 Further into the valley, by the river, are the women from the Aborghlou cooperative working on an organic fruit tree and medicinal plants nursery. We have been told it’s the first women’s cooperative in Morocco. Traditionally farming has been an activity for men, and through the project women are empowered by learning new skills and having their own income. The project is initiated by the High Atlas Foundation, an organisation supporting rural farmers to move away from subsistence agriculture, which they believe is at the root of rural poverty, and transition to organic cash-crop farming. Agricultural skills are also a cornerstone in the education at the Dar Taliba boarding school for girls, which in addition to maintaining ornamental, vegetable and aromatic herb gardens in the schoolyard, have implemented a program of ethnobotany, gardening and permaculture. Traditional plant knowledge and horticultural practice are an important part of wellbeing in Amazigh communities of the High Atlas. However, when children go to public schools for further education, they lose opportunities to learn about agriculture, gardens and wild plant use. At the Dar Taliba they teach girls to grow and use local plants that features in their ancestor’s lives, and are now in the process of compiling a book of culinary and medicinal recipes. If you go to Marrakech – eat at Amal! In the neighbourhood Gueliz, you can find the Amal Centre, a non-profit association dedicated to the empowerment of women from disadvantaged backgrounds including widows, divorced or single mothers, orphans, women who have worked as child maids, and women who have had little or no education through restaurant training and job placement. The restaurant made fresh juices for our food event on the rooftop. Besides being a very good cause, the restaurant makes delicious and affordable food.